Author and director of San Francisco’s Building ReSources, Matthew Levesque. Matthew will introduce us to his world of reimagining and repurposing an astonishing array of indigenous and local materials into garden designs. His talk is vividly illustrated with photographs of exciting contemporary projects intended to inspire us to design with unexpected materials. Matthew believes that discovering new uses for what you already have or discover in a salvage yard is budget-friendly and environmentally sound. In addition this approach is fun and creative. Matthew will share garden design projects and inspirational ideas for using salvaged materials found in the home, junkyard, or thrift store. He will share examples of thinking outside the garden box, such as seeing a rain chain in a pile of old keys or the infinite possibilities for scrap metal and pipes. Building ReSources is a non-profit organization that provides Bay Area residents with reusable, recycled and remanufactured building and landscaping materials. Its 1 ½- acre site demonstrates many projects possible using these castoffs. As the organization’s director, Matthew has shared his design vision with landscape architects and garden designers through workshops and exhibitions. 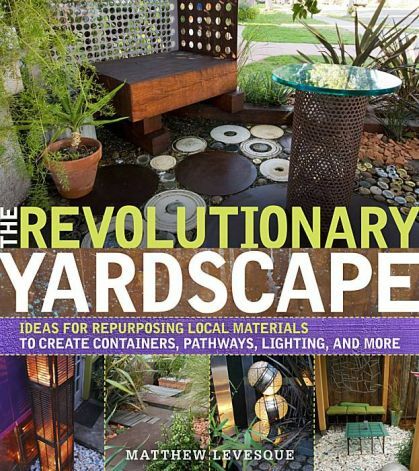 The Revolutionary Yardscape: Ideas for Repurposing Local Materials to Create Containers, Pathways, Lighting, and More will be available for purchase at the meeting for $15. As a special offer, we'll have a few copies of Handmade Garden Projects (by Lorene Edwards Forkner) that will be sold as a set with Matthew Levesque's book for just $25. Lorene was the speaker at our May meeting. Edible Plants with expert and SDHS Sponsor Bill Tall from City Farmers Nursery. Bring your veggies, edible flowers, herbs, etc. for the display table.